Over the years, several companies have tried to make the digital pen happen. Today, a new outfit has added itself to that list: Wacom, which has introduced a digital sketch pen. What distinguishes this digital ink slinger from its predecessors is its narrow target audience: artists. Unlike digital pens made for note takers, the Wacom Inkling ($199) works with any kind of paper. Digital pens such as the old LogiTech IO and the more current LiveScribe Pulse smartpen, need special paper to capture a scribblers' scratchings. 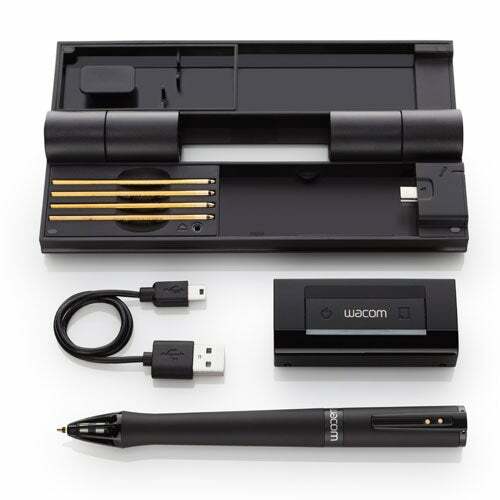 In another departure from its predecessors, Wacom’s product also uses two pieces of hardware--the pen and a small "receiver" that slides onto the top of a sheet of paper or the page of a sketchbook. As a sketcher draws on the page, their strokes are captured by the receiver. The pen also allows a sketcher to create "layers" on the fly with a click of a button. A layer is an overlay image that can be manipulated to obtain effects like allowing a background image to be seen through a foreground image. Layers are very useful when working with graphics programs, but trying to think in layers with a pen may be bit challenging. The pen also supports 1024 levels of "sensitivity." These levels allow the pen to interpret the pressure behind a stroke and accurately render its depth--something that would be impossible to do if the sketch were just scanned into a computer. When it's time to upload sketches created with the pen to a byte box, the receiver--which Wacom estimates can hold up to 50 sketches--can be plugged into a USB port and its contents stored on a hard drive. Incoming files can be converted into a number of image formats--JPEG, BMP, TIFF, PNG, SVG and PDF--by Wacom's Sketch Manager software. In addition, the product can be configured to load a receiver's files directly into Adobe Photoshop or Illustrator and AutoDesk Sketchbook Pro/Designer. There are some limitations to the unit. The price may be expensive to some consumers, although it's historically in line with past digital pen introductions. The largest size paper it can handle is A4 (8.3 by 11.7 inches). In addition, a clear line of sight must be maintained between the pen and receiver for the product to work properly, and the pen must stay at least 0.8 inches away from the receiver. And of course, there's the pen. It's a ballpoint and a little on the gawky side, although more attractive than most of its digital pen kin. For artists who do the New York Times crossword puzzle in ink, sketching with an ink pen shouldn't be disconcerting. It will pose problems for draw-and-erase sketchers, though. Although clearly targeted at artists, the pen might also be useful to organizers who find keyboard and display less satisfying than pen and paper when creating mind maps. According to Wacom, Inkling should be making it to retail shelves in the United States and elsewhere in the world in the "next few weeks."